I want to start by saying I was honored to be invited to present a teambuilding workshop to the American Red Cross of Chicago & Northern Illinois earlier this week. On a personal level, I was excited to work with the Red Cross. I’ve always been a huge fan of the work they do and I’m humbled by their mission to make the lives they touch better in times of emergencies. While I know what I did pales in comparison, I’m glad I was able to give them a ray of sunshine in a dark and stormy hurricane season. When I sat down a few months ago with Dawn Breen, Regional Volunteer Services Officer for the American Red Cross of Chicago & Northern Illinois, we discussed what the American Red Cross was looking to achieve by partnering with ImprovThis. The key takeaways from that conversation formed the direction for what would eventually turn into the workshop ImprovThis presented earlier this week. The Red Cross had a few opportunities for growth they were looking to address. First, this region covers a large geographic area and they have staff and volunteers spread out across multiple offices. Their quarterly meeting presents a relatively rare opportunity which brings everyone together in a single location. The Red Cross wanted ImprovThis to create a feeling of everyone being one big team and to break down the barriers that the physical distance between the offices creates. Second, we knew this time of year is a busy season for bad weather and disasters. 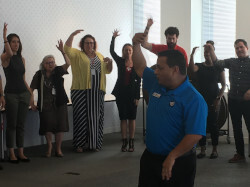 The Red Cross asked ImprovThis to focus on light-hearted exercises and to “Bring The Fun!” The goal was to create a memorable experience where the participants would feel motivated and encouraged to use the tools they learned in the workshop once they return to their home offices. Of course, everything was not going to be just fun and games. The Red Cross Leadership Team planned to present the results from the most recent Engagement survey during this meeting. They wanted to get everyone ready and excited to offer input on what initiatives could be taken to improve the survey scores over the coming year. With this in mind, they asked ImprovThis to create an environment where the staff and volunteers would feel creative and ready to think of out-of-the-box solutions. With these goals as the starting point, we worked together to design a custom workshop for the Red Cross that fit into the meeting’s time constraints and delivered superior results. 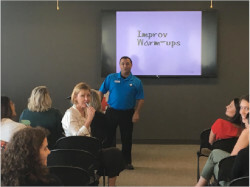 First, we focused on activities which would get the team up to speed on the Three Pillars of Improv™ as quickly as possible. Then I suggested several exercises that would have everyone interacting with people they may not normally interact with. While all that was happening, there was a considerable weight put on “Bring The Fun!” because we were focused on the staff and volunteers building positive relationships with their teammates. We decided that ImprovThis would facilitate six activities for the teambuilding workshop. We’d begin with some physical and voice warm-up exercises which participants could use to improve their effectiveness in public speaking. These warm-ups set the tone for the workshop by being fun and goofy. The next section of the workshop looked at teambuilding and increasing the Emotional Intelligence (EQ) of the participants. 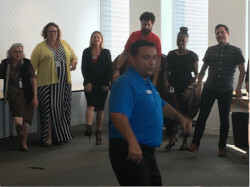 The activities in this section trained the participants on how to use the Three Pillars of Improv™ to create stronger connections with their teammates. The discussion after each exercise provided examples of how they could use each pillar in their everyday life. Unfortunately, this team meeting was scheduled a few days after hurricane Florence made landfall in the Carolinas and required a response from the Red Cross. Even as many of their teammates were deployed for disaster relief, those who stayed behind to run the offices came together in downtown Chicago for their quarterly meeting. How helpful were the Improv activities in bringing the workshop’s content to life? How likely are you to apply the concepts taught in the ImprovThis workshop? Fantastic experience. Stimulated great interaction and thought on how to communicate differently. – Mark B.
I really enjoyed the exercises and appreciated the fresh and interactive approach. This is just what we needed – thankful for the very memorable experience. – Erin C.
It was energetic and fun; allowed for learning + reflecting in a very positive way. Also encouraged working with people I may not have interacted with before or on a regular basis. – Emily B.
I highly recommend to anyone who works on a team! – Hannah M.
These roundtables were very successful. The ImprovThis teambuilding exercises helped bring the staff together. We came out of the discussions with some great ideas that may not have come to light without the tools the team learned in the workshop. – Dawn Breen.